Project stakeholders were given a first-hand look at some of the $2 billion Connections Project’s most impressive structures during a recent tour. 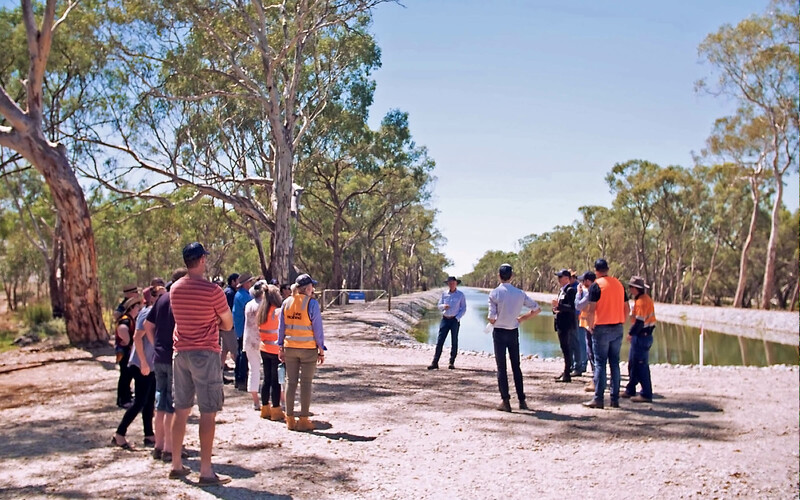 The tour covered some of the Project’s significant works in the Torrumbarry Irrigation Area, including a large pump station suppyling about 20 landowners on two different pipelines through six submersible pumps – all controlled remotely. It also visited Box Creek Weir, which was completed to generate more reliable irrigation flows to Box and Pyramid Creeks. The structure, made of 1,240 cubic metres of concrete and 300 tons of steel, has a capacity to deliver up to about 2,500 megalitres per day through its four irrigation gates. Another tour highlight was a channel remediation site in which the project remodeled and lined the channel with geosynthetic clay in last year’s winter works program to stop water previously lost to leakage and seepage. Connections Project Acting Early Contractor Involvement Manager Daniel Arnold said last year’s winter works program was one of the largest in the project’s history. Across the Goulburn-Murray Irrigation District, more than 33km of irrigation channel was upgraded, more than 35km of pipeline was installed, more than 500 outlets were upgraded or rationalized and more than 250 channel automation sites were installed. In the Torrumbarry irrigation region alone, more than 16km of pipeline was installed, 14km of channel was remediated and more than 50 sites were automated. The stakeholder tour visited a remediation site on the 2/4/1 channel near Cohuna. “This was a great opportunity to show people what we’ve constructed in the Torrumbarry area and the works we’ve carried out – they can see it on the ground and in operation,” Mr Arnold said. “This shows we’re continuing to get on with delivering works, more than a year on from the adoption of the Reset Delivery Plan,” Mr Fisseler said.